President Nicolas Maduro has ordered the closing of Venezuela’s embassy and consulates in the United States, a day after severing diplomatic ties with Washington over the US recognition of an opposition leader as president. On Wednesday, Maduro ordered all US diplomats to leave Venezuela within 72 hours. 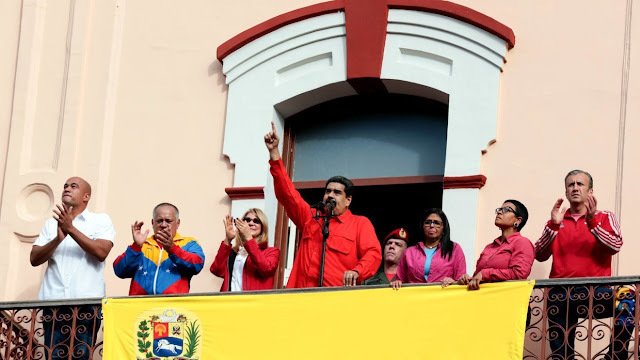 However, the self-proclaimed president Juan Guaido has countermanded that order – and the State Department announced no US diplomats would be leaving, threatening consequences if anything happened to them. Guaido is the leader of the Venezuelan National Assembly, a legislative body last elected in 2015. He claims Maduro, who was sworn into his second term earlier this month, is an illegitimate usurper. The US led the way in recognizing Guaido’s claim, followed quickly by Brazil, Canada, the EU leadership, and most of the Organization of American States members. Mexico has not recognized Guaido, however, and Bolivia has openly declared support for Maduro. Venezuela’s Foreign Minister Jorge Arreaza has accused the US – and President Donald Trump personally – of fomenting a coup in Caracas. In an interview with RIA Novosti, Arreaza described the countries who recognized Guaido as “carrying out the orders of their master” in Washington. Russian Foreign Ministry spokeswoman Maria Zakharova said that Washington’s “handpicking” of leaders in Venezuela best demonstrates the actual attitude of the “progressive Western community” regarding international law, sovereignty and non-interference in the internal affairs of other countries.